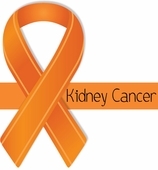 An orange Ribbon is used to designate Kidney Cancer Awareness. An excellent way to show your support for a loved one with kidney cancer is by wearing one of the items below. A percentage of all sales is made to the American Cancer Society for research.